Today Dan and I celebrated 25 years of uninterrupted, wedded bliss. Psych! I have no complaints, and if Dan knows what’s good for him, neither will he. I have opined on the keys to a successful marriage before, here and here, but as a public service I will reiterate the most important points. And on that last note…what a surprise I had this morning when Dan gave me pretty much the best anniversary gift ever. 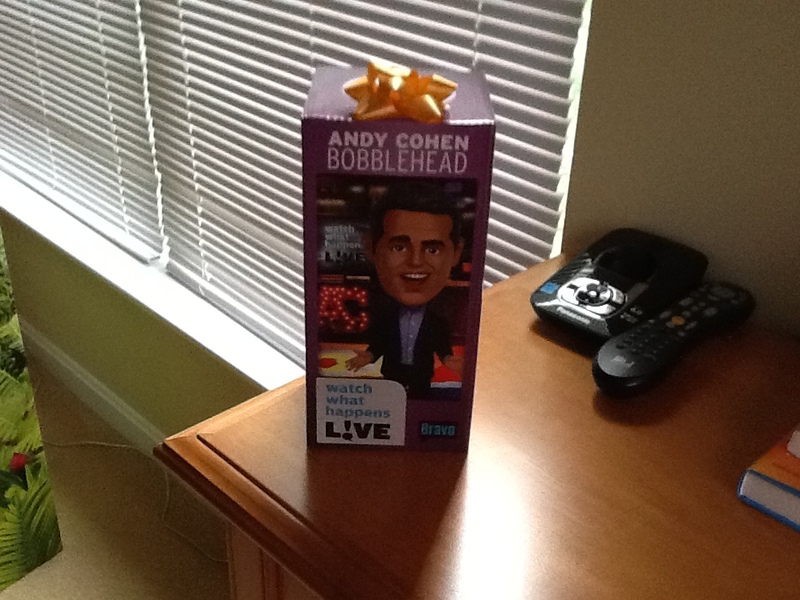 Andy Cohen bobblehead!! Score! I’m telling you, it just doesn’t get much better than this. My Andy bobblehead has moved into first place in my heart, soaring past my Darth Vader bubble gum machine. I bet you are all waiting with baited breath to hear about our romantic evening. Well first I spent the better part of the afternoon at Dulles airport. We are thrilled that our friends are here from Munich, but their plane landed at 3:00pm and they didn’t clear customs until 4:30. That’s a long time standing around arrivals waiting to do my infamous slo-mo run and fake cry greeting. You know what though? I think it was worth the wait. I was almost able to work myself up to a fake tear. On the other hand, international arrivals is a pretty good spot for people watching. First, and no surprise, people annoy the hell out of me. I am 5’3” on a really good day. Why does the guy who is 6’5” insist on standing directly in front of me? And then there are these idiots who bring their small children to arrivals and say “watch that door, Daddy will be coming through it any minute!” But 45 minutes later, when Daddy still hasn’t appeared, that kid is going to be a whiny weepy mess. And maybe that’s what you signed up for, but I did not. At any rate, by the time we got to the car we’d all about had it, so we headed to our favorite little romantic dinner spot…Uno’s. The wine, the candlelight, the delicate sauces…what an evening! And Dan, proudly telling the waitress it was our 25th anniversary. Then telling her he’s furloughed and he’s a contractor so he’s not even going to get back pay. Then brazenly asking for a break on the check, under all of the circumstances. Ahh, that’s my Dan. I know that all is right with the world when he’s talking and I’m praying for a hole to open up beneath me before I die of embarrassment. On the other hand, Uno’s comped us a pizza, and our dear friends are here to celebrate with us, so…it was truly an evening to remember. Can’t wait to see how our 50th turns out! This entry was posted in Uncategorized and tagged Celebrity, Culture, Family, Friendship, Marriage, Television, Travel. Bookmark the permalink.